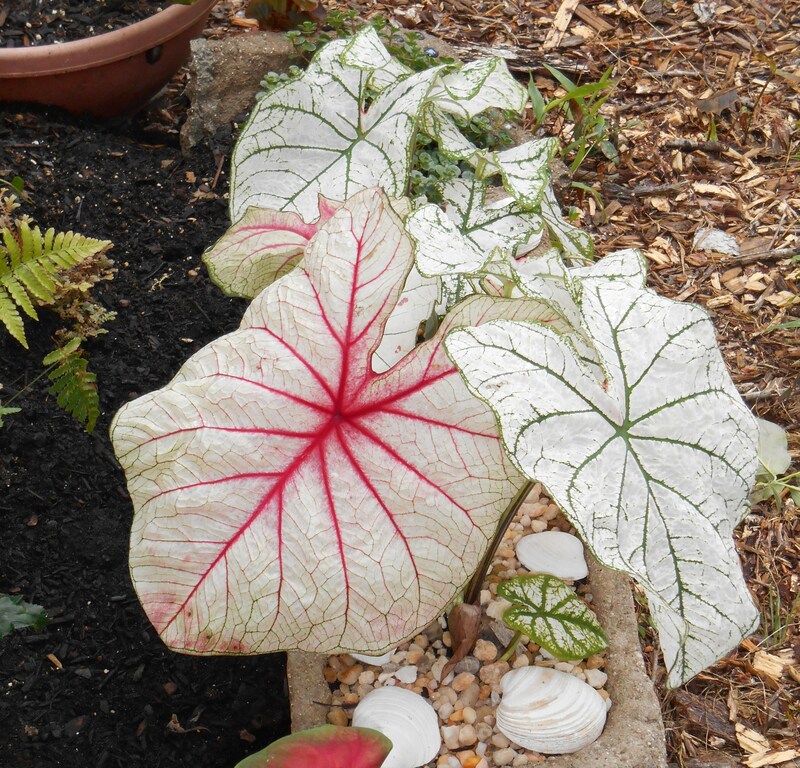 Caladiums are one of my favorite plants for the summer garden. So easy to grow, they are strikingly beautiful. 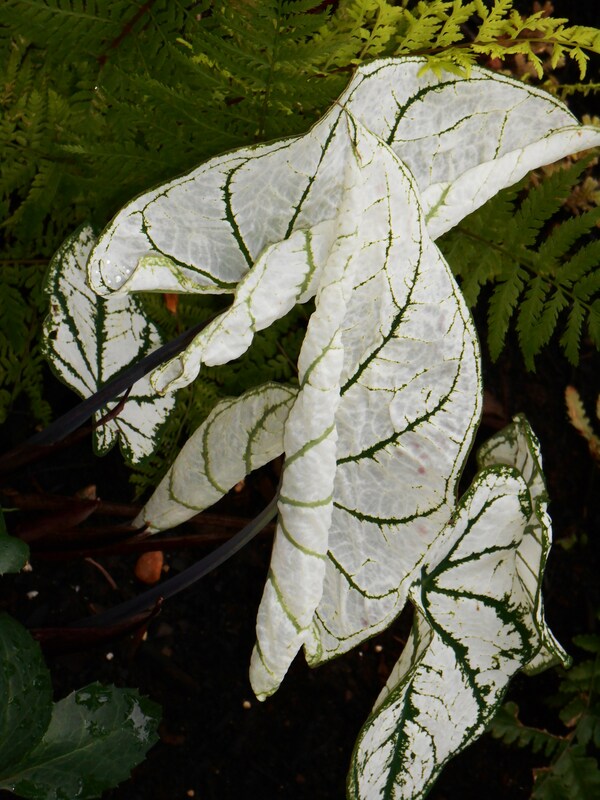 I enjoy the intricate patterns etched into their huge leaves in bright tropical colors. Each leaf is a little different from all of the others. 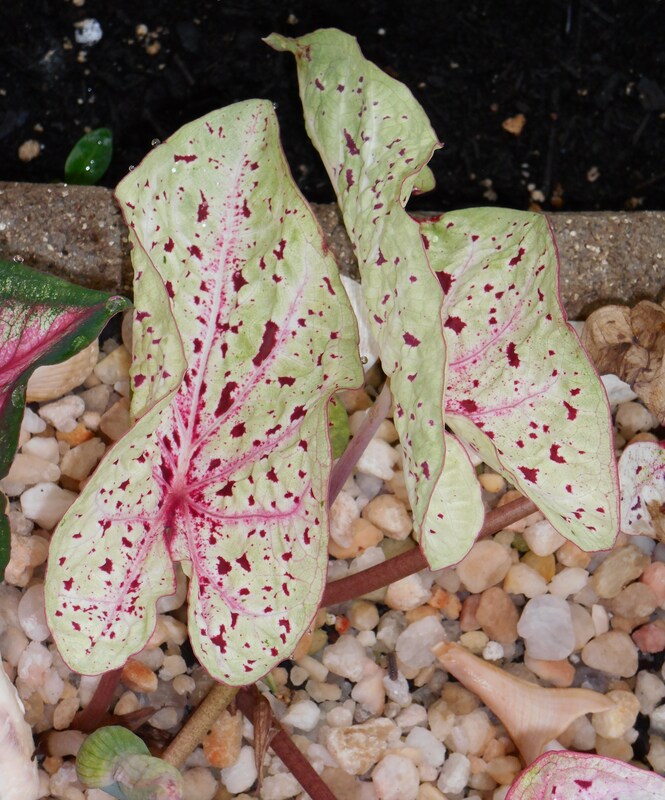 Had you been sitting with me and helping as we unpacked this year’s Caladium order, you might have thought me certifiably crazy…. 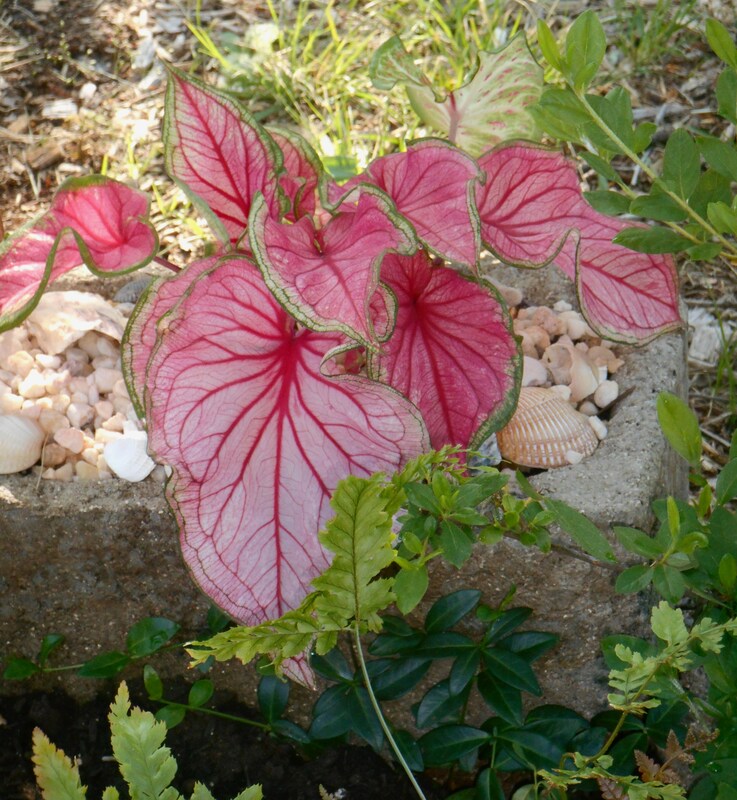 crazy for Caladiums, that is. When I begin looking through a catalog of Caladiums, it simply isn’t possible to select just one. So some friends and I combined our orders for Caladiums from a grower in Florida. And since the best prices are had when Caladium tubers are purchased in lots of 25 or more, I needed a lot of gardening friends to share the bounty from such a gargantuan purchase. 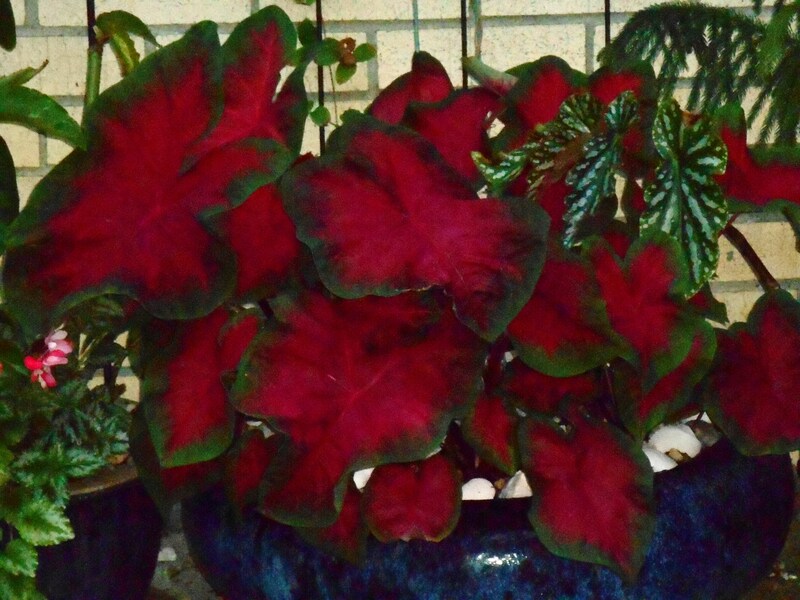 Caladium, “Red Flash” ordered for a friend who wanted all red Caladiums. This variety can take more sun than most, and grows into a vigorous, large plant. So enough of us banded together to purchase six different varieties, plus a lot of 25 mixed tubers, just to see what we would get. Do the math: that is 175 large Caladium tubers spread out across my dining room table. 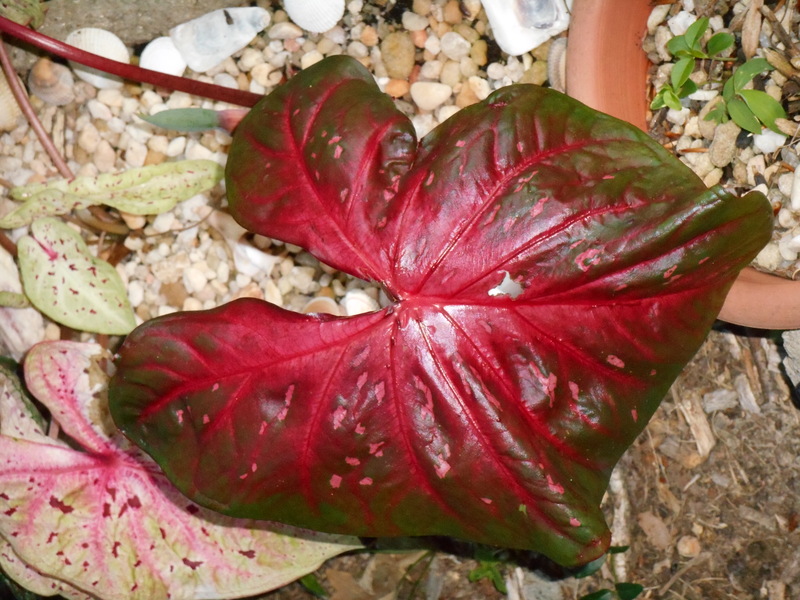 The final Caladium plants came out into the garden on June 7. This final hypertufa trough also holds the Saxifraga stolonifera we found at Forest Lane Botanicals this weekend and some Begonia semperflorens. 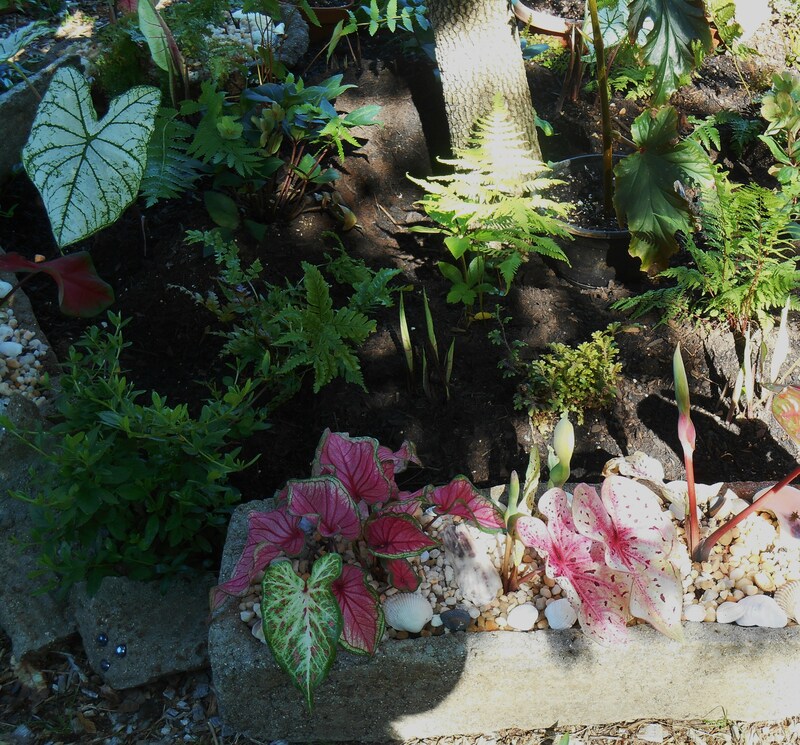 Although one or two friends wanted their Caladiums all the same, most of us were interested in a mixed batch. And so based on the preferences each friend expressed, the tubers were divided up and delivered in early April. Even dormant tubers must be kept consistently warm. They won’t survive a freeze, and may be damaged if kept below 50 degrees for any length of time. That is why our order was delayed by several weeks. The dealer, Bill Kurek, waited for a long enough stretch of warm weather in Virginia before he shipped the order. 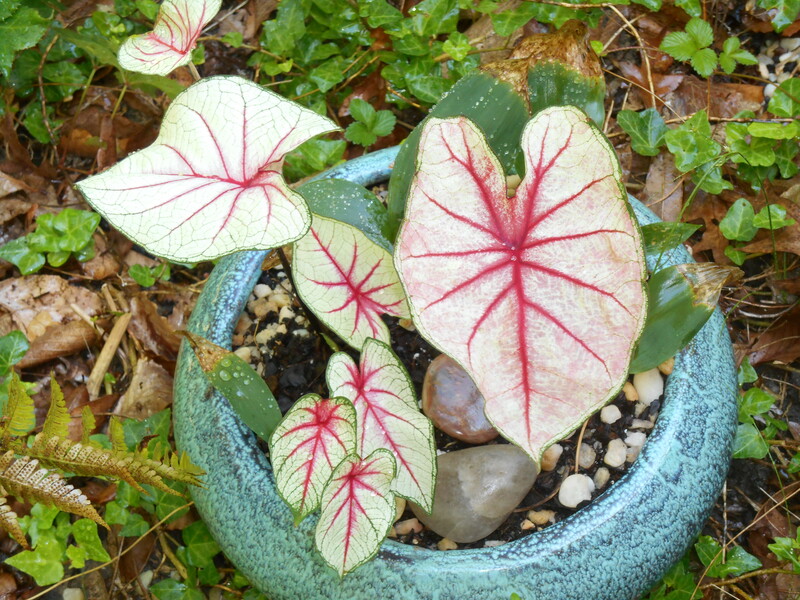 Some of us waited to plant the Caladiums outside once warm weather settled in for good. But I planted ours in plastic boxes of potting soil within just a few days of receiving them. I’ve been bringing the Caladiums outside, a few at a time, over the last few weeks. Believe it or not, one of those boxes was still over half full of tubers, just beginning to send up their first leaves, a week ago. Given the warmth of sunshine on their soil, those outside are growing far more quickly than those left inside, waiting their turn. All these plants will require, for the next five to six months, is consistent moisture. Calaldium, “Red Flash” on top, with C. “Miss Muffet” below. 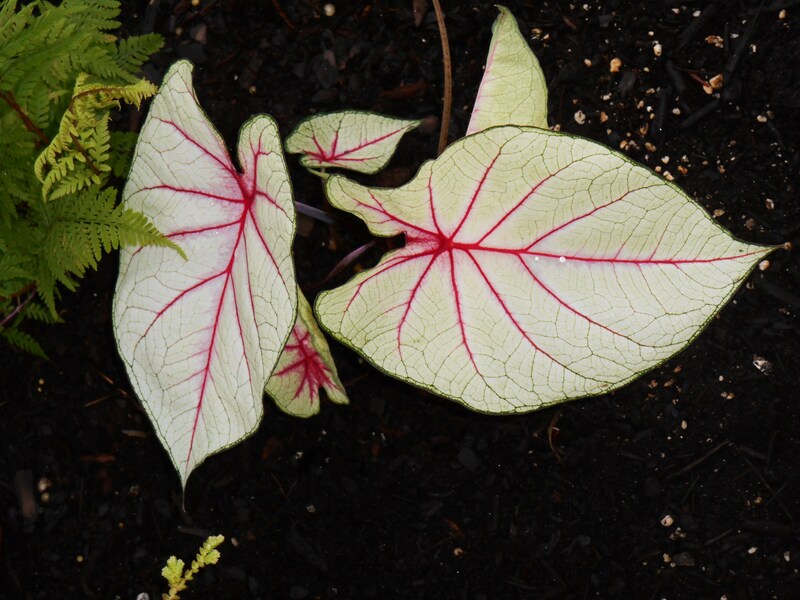 Grown for their leaves and not their flowers, Caladiums aren’t heavy feeders. They’ve already been fed with Osmocote, a time release fertilizer, and were given a good drink of Neptune’s Harvest when transplanted. 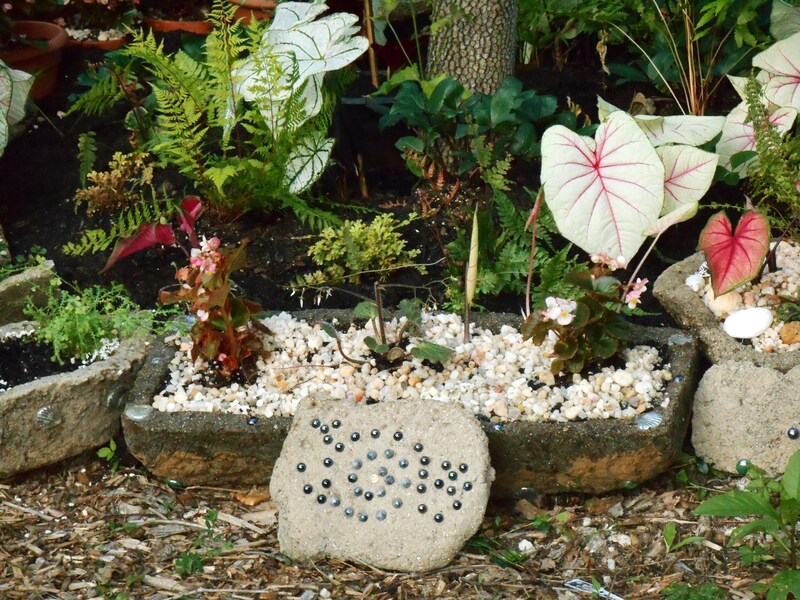 Minerals in the Neptune’s Harvest help the Caladiums establish by supporting new root growth. 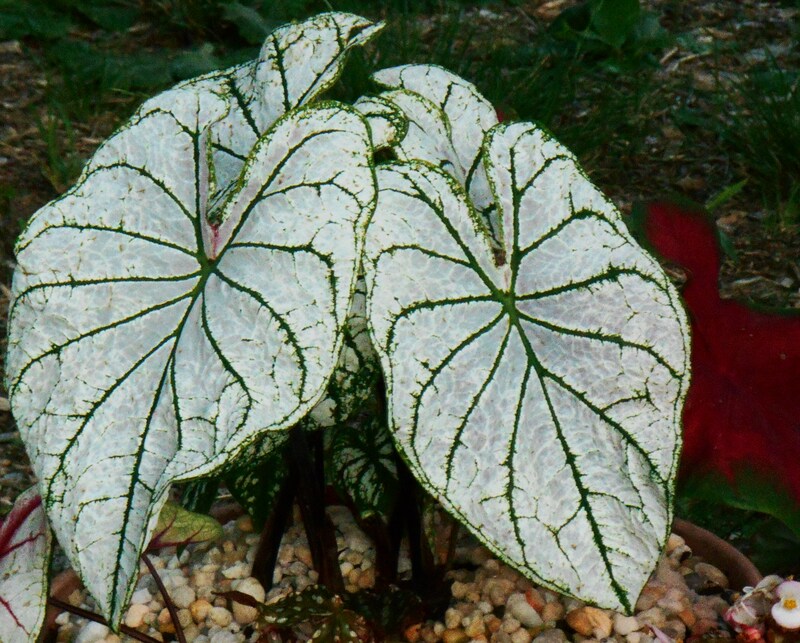 Caladiums prefer partial shade. 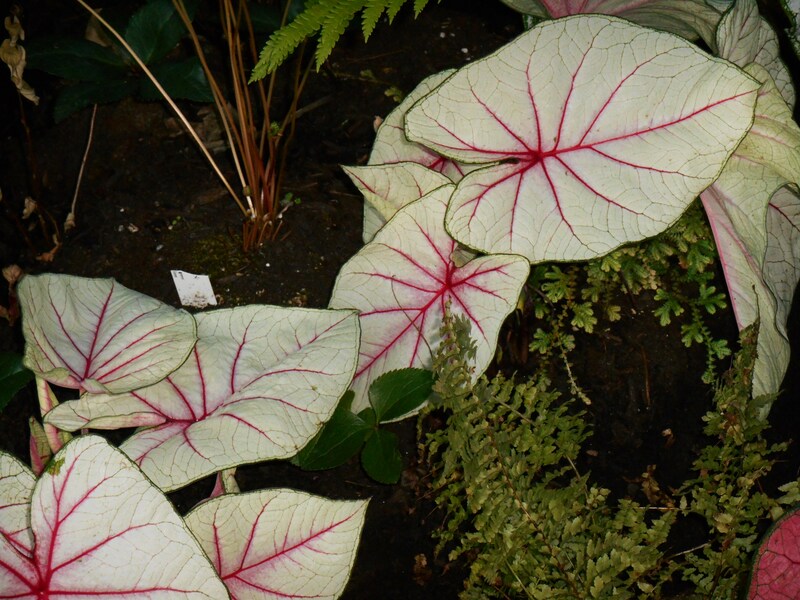 Newer cultivars have been selected to tolerate more sunshine than older Caladium varieties can tolerate. 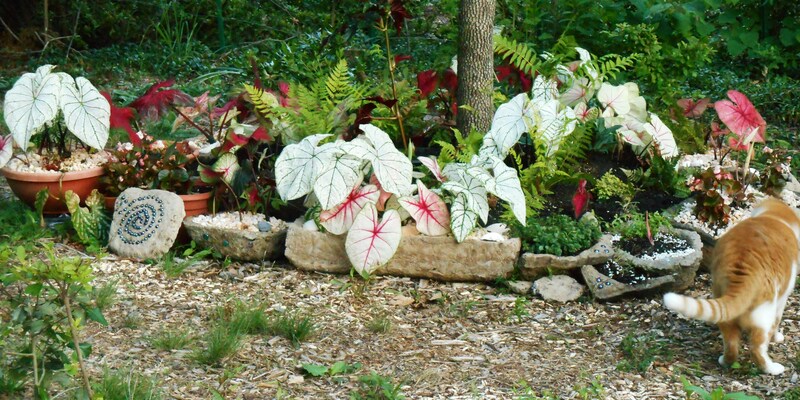 Any Caladium with “Florida” in its name is a newer hybrid and can take at least a few hours of sun each day. Given warmth, light, and moisture Caladiums will grow indefinitely. Perennial in Zones 10 and south, these lovely plants won’t survive a Virginia winter out of doors. 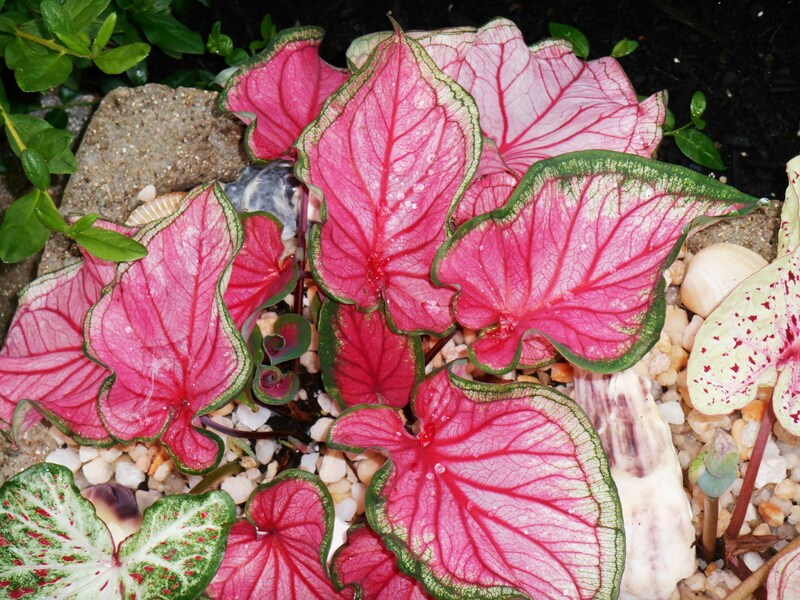 They are true tropicals, and their huge lovely leaves lend a tropical summertime flair wherever they are planted. Even though they can go directly into the ground after the soil warms, I still prefer to plant mine in pots. It is much easier to bring them inside as cold weather approaches. 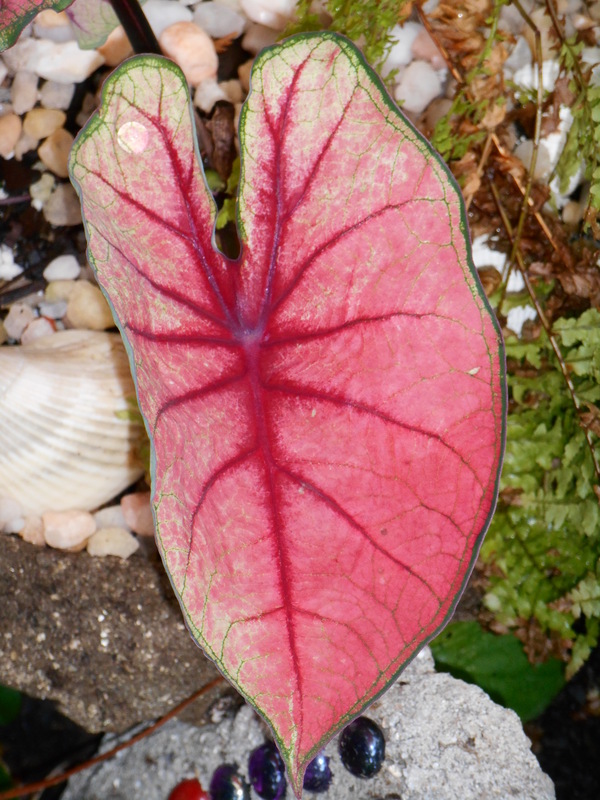 All parts of the Caladium are poisonous, another reason we grow them in abundance. They won’t be grazed by a hungry Bambi who happens to find its way into the garden. 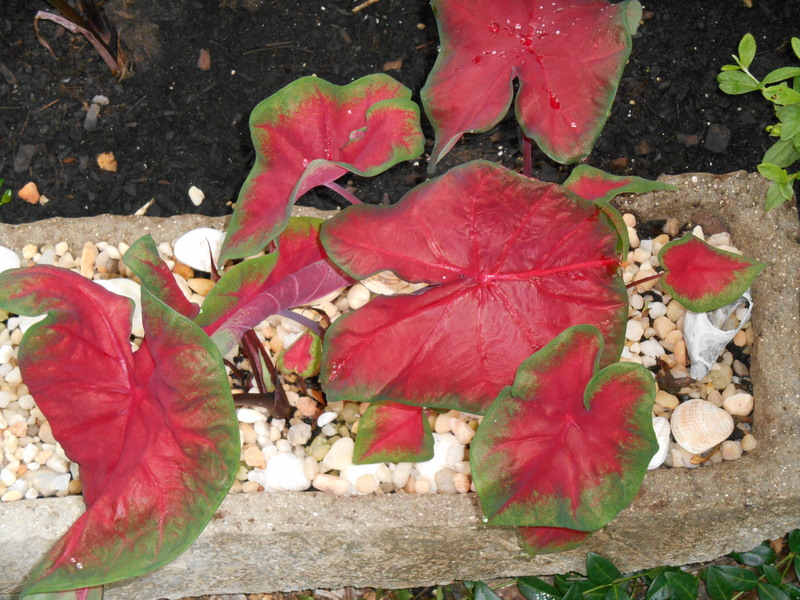 Caladiums are purely ornamental in our summer garden. They won’t feed birds or give them shelter. They won’t attract hummingbirds or butterflies. Pure eye-candy, we grow them for their beauty. With minimal effort from us, they give maximum pleasure for the rest of the summer. You can still order this year, Becca, and you can probably enjoy them a few more weeks into the fall than we can. Florida Sweetheart is one of my favorites with the gorgeous pink veins. Why aren’t they popular in TX? I have no idea … caladiums usually make me homesick … but since I’ve spent so much time with my mom over the past year — I am able to enjoy my “spring and summer” flowers/foliage as they emerge. I will return and investigate more — 😀 Thank you for the idea reminder of “always having a pot” — I will make a note to remind myself of it each year — so I don’t forget in the frenzy of everyday life. 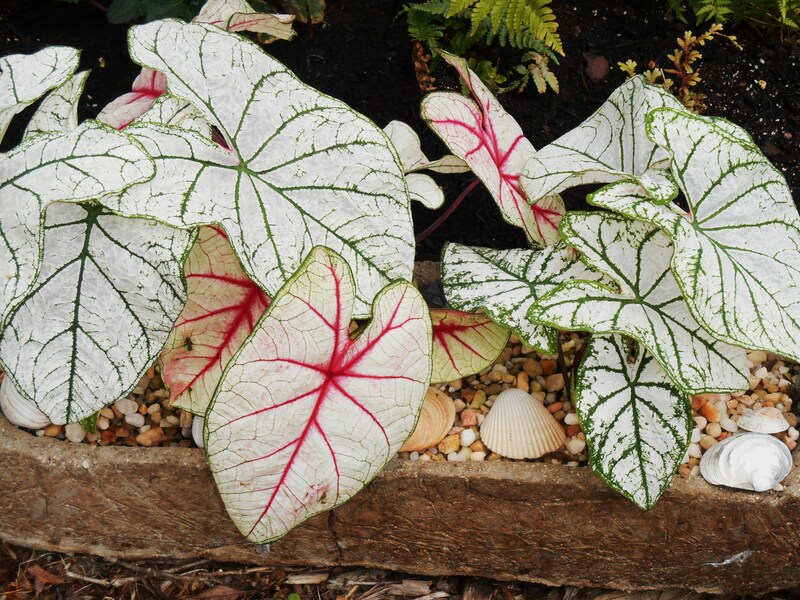 I love your caladiums, they are beautiful! 🙂 I planted mine in the garden beds and they are just now starting to leaf out! I just dug up and gave away some of our red and green ones to plant the remaining Florida Fantasy from the garage. My husband prefers the red ones, too, so I left enough for him to enjoy. Does anyone outwork you? LoL 🙂 The most fascinating leaves on the planet here! Me LIKE!!! Too much Puritan work ethic in my upbringing, quite obviously. Missing your poems, by the way. Hope you’re doing OK. I am fine! Tripping around, meeting new people, seeing beautiful trees and all kinds of gorgeous photos everyday is what I do for a hobby. 🙂 I do color commentary world-wide, as if I were a missionary. When I’m knot parenting, this keeps me out of trouble. Try this on for size when you can spare 10 minutes?